We also want to thank Alan Berkowitz and Lou Hollander for what they have been doing to clear up this confusion. We've been receiving a number of phone calls and emails regarding the proper form to complete and send in to NYC Health Benefits for those who did not receive the full amount of their Social Security Medicare Part 'B' withholding. We hope this will clarify the issue. What the City did was to reimburse eligible retirees and dependents the Part 'B' premium of 2017 which was $109 per month. The basic amount of Part 'B' premiums for 2018 was $134 monthly. This should show on the Social Security letter you received in November or December of 2017. If your modified adjusted gross income (MAGI) for 2016 was between $85,000 and $107,000 for single then you were being charged the monthly IRMAA premium.of $53.50. Rates increased depending on your MAGI. For married filing jointly with their MAGI between $170,000,01 and $214,000, the monthly premium was $53.50. Again, rates went up according to your MAGI. Now for that form. If the Social Security form SSA-1099 for 2018 showed you only paid the basic amount of $134, then you should fill out and mail the 2018 Medicare Part B Reimbursement Differential Request Form. click below for the link to that form: https://www1.nyc.gov/assets/olr/downloads/pdf/health/med-b-differential-form-2018.pdf If necessary, you can file for 2017, too. For those retirees who paid the IRMAA premium in addition to the basic monthly premium of $134 (also shown on both the SS letter received in late 2017 and on the SSA-1099 for 2018, then you should fill out the 2018 Medicare Part B IRMAA Reimbursement Form; https://www1.nyc.gov/assets/olr/downloads/pdf/health/irmaa-form-2016-2018.pdf. You can also submit for 2016 & 2017 if necessary. Please submit the form, along with all required documents, to: NYC Health Benefits Program / Attn: IRMAA Unit / 40 Rector Street, 3rd Floor / New York, NY 10006. Payments are expected some time in early 2020. The next issue of our newsletter, "Beyond the Line" (#2019-1) has been printed and sent to the mailer with a mailing list as of today, April 9th. It should be received within the next 2 weeks, pending efficiency of the US Postal Service. We cannot afford first class mail, so these mailings do take longer. If you have moved recently and not informed us of your new address, please do so as soon as possible to receive your copy. If you know of fellow officers who have moved and do not have computer access, please contact them and let us know. We ask if you have any article or stories you would like to see in the next issue, please send them to me or Frank. If at all possible, a Word format document would be appreciated. Photos should be originals or scanned and attached to an email. Originals will be returned. Xerox copies or newspaper articles do not reproduce well. The Executive Board wishes to thank all those members who maintained their membership by sending in their dues and we want to give a special thank you to all those who were able to send in a donation of any amount. Due to the high number of donations, we had to place another order for the association challenge coins. If you wish to send in a donation in the future, please let us know if you would like one of the coins we give as our thanks and appreciation. As a final reminder, only members paid up for 2019 will receive their copy. If you haven't paid, please do so as soon as possible. 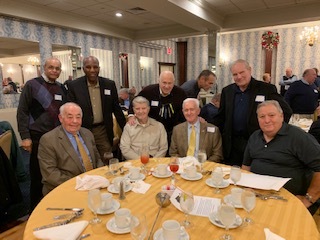 Vinnie Servedio did another great job putting together this ROMEO & JULIET luncheon held on March 20th at Stella's Restaurant in Floral Park, Long Island. There was a big turnout of around 36 persons. Here are a few photos taken at the affair. Just wanted to let you know that we are sold out for the Mets game. I have sold 150 tickets. Due to overwhelming demand I have been able to get an extra 25 tickets. They will be in field box third base side sections 130 and 131. Same price. $113 per with an opportunity to take a picture with the group on the field before the game at 5:45 pm. If you still want to go, better hurry as all the other tickets sold out fast. The meeting was called to order by President Mike Lanning who led the membership in the Pledge of Allegiance. 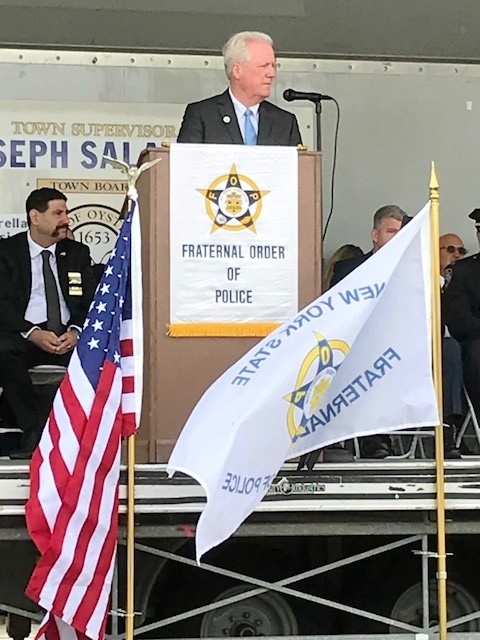 Treasurer Tony Lomanto then read off the names of our fellow officers who passed away since the December meeting and asked for a moment of silence for them and their families, for those on the Sick List and for our fellow Police and Armed Forces serving in harm's way. 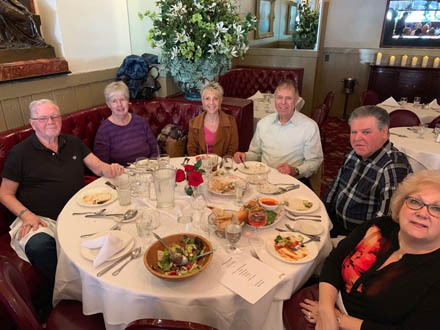 The meeting was put on hold and Mike introduced Ms. Danielle Becker, an attorney from the Ettinger Law Firm, which specializes in elder law, wills and trusts and emphasized the importance of items like a Power of Attorney. Ms. Becker gave a very interesting and informative discussion on the different types of trusts and wills and after her talk, she answered many questions from the members. If you are interested in this matter, please contact Ms. Becker at 1-800-500-2525 X124. The firm can be viewed at www.trustlaw.com We want to thank member John Kaim for recommending Ms. Becker to us as a guest speaker. 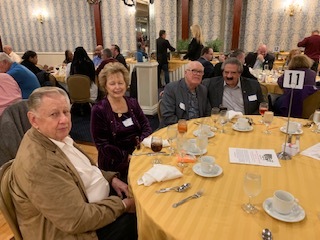 Our second speaker, Peter Laddomada, was from BJs Wholesale Club and gave a talk on membership savings for members of the Retirees Association. At this time, members can join or renew their current membership for only $25. Inner Circle and Perks Rewards are also offered at a discount. If you are interested, please call Peter at 718-637-7487 and mention you are a member. If you are a current BJ's member, you will need your membership number handy. Peter also donated a bottle of wine for the raffle. 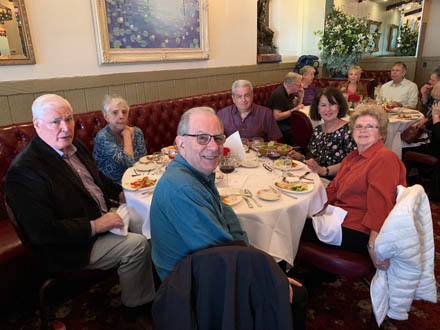 1st VP Bob Valentino spoke of the May meeting luncheon to be held on May 1st at Verdi's Caterers. It will start at 1:30 PM and we look forward to a large attendance. Tony Lomanto mentioned the NYS FOP Police Memorial Day will be Saturday, May 4th at 11:00 AM at the NYS FOP HQ in Hicksville. There will be over 70 names to be added to the wall and if you can, please attend and show the families of the officers they are not forgotten. The Retirees Association donated $200 to the FOP for the maintenance and expenses of the Wall. 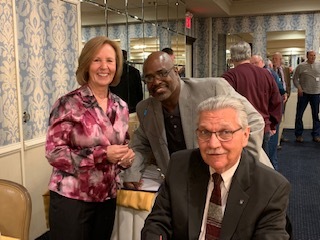 2nd VP Vinny DiMaio spoke of the bill in Washington (HR1156 LEOSA Reform Act) to amend HR218 and allow changes in magazine capacity, and allowing carry in places like schools and Federal buildings and sites and other changes. 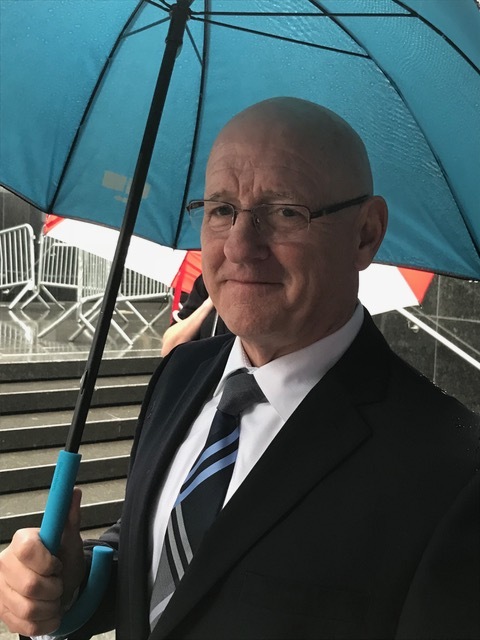 John Moakley spoke about the recent news that the NYS Department of Corrections and Community Supervision Parole Board had disconnected a computer link to their office where concerned family members would lodge their protest against the upcoming parole hearings for convicted cop killers. The link was established in 2012 and was used by many. Unbeknowst to the NYPD PBA, that link was disconnected in 2014 without any notice given. As a result, recent parole hearings that enabled cop killer to be set free never received the many protests. The PBA immediately sent a letter to the DOCSS chairwoman calling for the immediate reinstatement of the computer link. The link is now directed to the PBA office on their website http://www.nycpba.org and click on the "Cop Killers" tab. 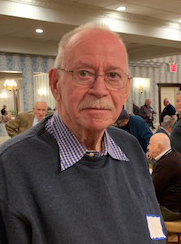 Tom Greer told the membership that all 125 tickets originally purchased for the Mets-Yankees game on July 2nd had been sold out. He purchased another 25 and if you are interested, please contact him. See the March 13 entry just below. Legislative Director Tony Piazza spoke of the ongoing battle for the VSF. Now that the Democrats are in control in Albany, we must ask for their support on any bills to be presented on our behalf. The 50/50 raffle was held and prizes awarded. Our thanks to John Reeves for supplying many of the shirts and other items and we wish him well in his current medical matter. Just letting you know I have purchased an additional 25 tickets for the Mets-Yankees game on July 2nd. The first batch of 125 tickets were already sold. These 25 are in sect 105 next to the first seats in 106. Same price $113 per seat with an opportunity to take a picture on the field before the game. If you happen to be in the NY area during this time, you may want to consider joining your fellow officers at this memorable event. Anyone interested can mail me a check, made out to me, to 508 Harbor Rd Cold Spring Harbor NY 11724. Call me for any info you may need. 631-902-8911. Or 516-419-6146. Thanks for your hard work, Tom. We've been receiving a number pf ohone calls and emails asking about the staus if the Transit Police ID cards that had been temporarily stopped by the NYPD Transit Bureau due to malfunctions in the card system. As you know I have been working on this issue. New equipment has been ordered and received. The cards have been redesigned and we are having a slight issue with the hologram. Once that is corrected, I will do some test cards to ensure suitability. I anticipate this being completed in the near future. Thanks, Bob. It's good having someone on the "inside" helping the retirees. 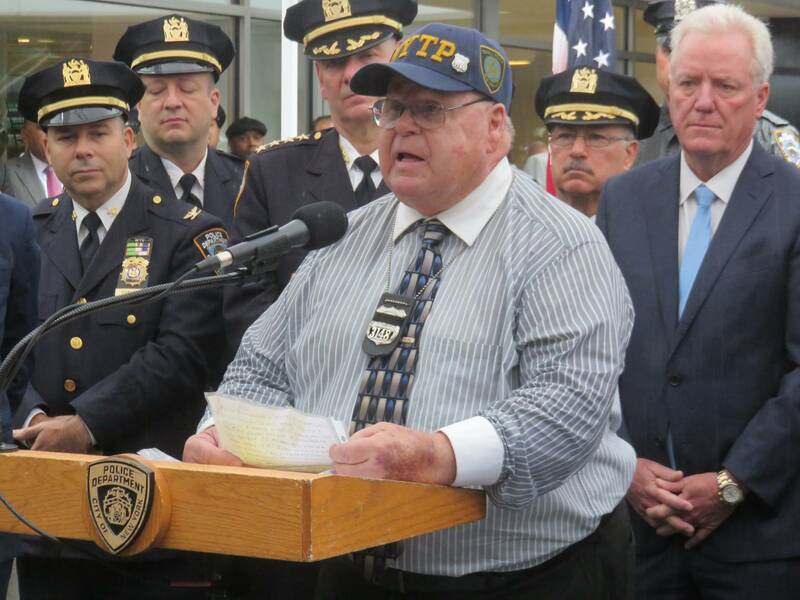 Joe McGarry announced that the Transit Police Memorial FOP Lodge 317 will hold a Defensive Driver Training Course to be given on April 13th at 10:00 AM at the NYS FOP building located at 911 Police Plaza Hicksville. The cost is $40 and you must call Joe at 516-314-0155 if you wish to attend. We have said that the hotel rooms for the reunion were going at a record pace. We were just notified on this past Friday, that all the rooms allocated to us for the reunion have been booked. That being said, we don�t want anyone who wishes to attend the reunion to think that they have been shut out. As of Friday, the hotel has been advised to tell anyone calling for a reservation that they can be placed on a standby list. Historically, as we get closer to the reunion, we have people who for whatever reason cancel their reservation. If for any reason you must cancel a confirmed reservation, please do not call the hotel. Notify the committee so we can make sure we do not lose this room. We will be carefully monitoring the stand-by list and this is the only way we can be sure that the room goes to our people. In addition, we have a plan B, if you will. The hotel has two sections .The section we reserved is the North Tower. These are the prime rooms. The hotel also has room, in what they call, the South Tower. These rooms have everything that�s in the North tower i.e., refrigerator, microwave, etc., but may not be as nicely furnished as the North Tower rooms. We have negotiated with the hotel to rent these rooms at a $15 per night reduction in price. 1. You may call for a reservation and specify that you wish to go on the stand-by- list for a North Tower room only. 2. You may make a reservation in the South Tower and request that your name go on the stand-by list, should there be an opening in the North Tower. After this, if a room were to become available in the North Tower and you are next on the stand-by list, you may opt to change your reservation to that North Tower room. When making your reservation for the South Tower, you must advise the person taking the reservation that you want your name to remain on the standby list for a room in the North tower. 3. And finally, if the idea of the South Tower does not make a big difference to you, go ahead and book your room in the South Tower and enjoy the savings. If you choose any of these options, please go to the reunion web page http://nyctpfloridareunion.com/reservation-form.html and submit a Registration form so we can monitor your status on the stand by list. 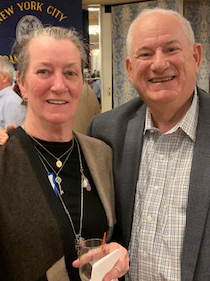 Through the tireless work of Marilyn Scahill and Paul Murphy, another NY Reunion was an outstanding success and we congratulate them. 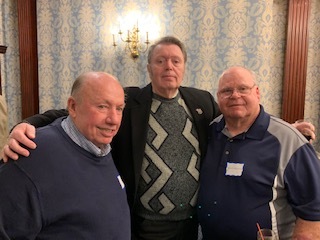 The first meeting since Ed Russo's passing was ably conducted by our new President, Mike Lanning. The meeting was called to order and Mike led the pledge of Allegiance. 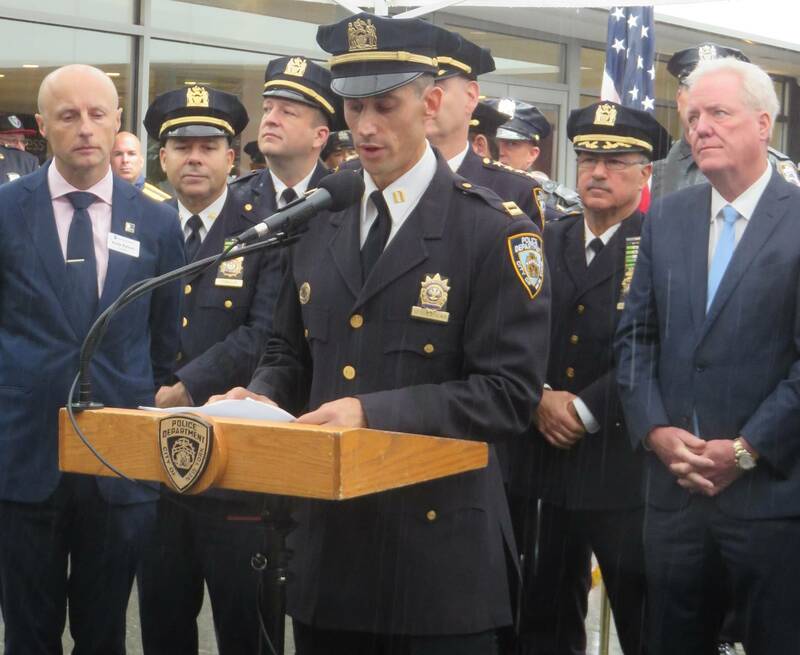 Tony Lomanto read the names of those who passed away since our last meeting in October and reported that since January 1st of this year, 56 fellow officers that we know of, passed away. 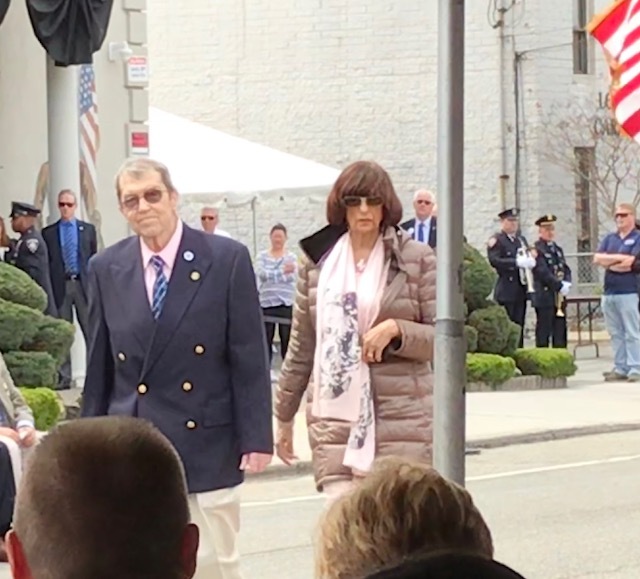 There was a moment of silence for them, their families, those on the Sick List and all those in Law Enforcement and our Armed Forces serving in harm's way. 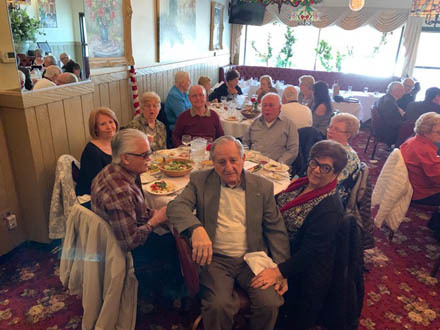 We had a guest speaker, Bob Vessichelli from PSE&G, the utility service on Long Island, who gave a video and talk on the many possibilities that exist out there for scamming the public, and mostly senior citizens. Bob is a retired Suffolk County Detective and is in the security section of the utility company that handles the many phone scams their customers receive. Many members present have experienced the many phone call scams alleged to be from the IRS, Microsoft, solar panel companies, and even those alleging pleas for money from "grandchildren" supposedly in jail or other reasons asking for cash. These phone requests usually ask for the person to purchase some type of gift card at a local CVS or Walgreen's and have the monies transferred to a location specified by the scammers. The bottom line is to be aware and be alert to these phony calls. 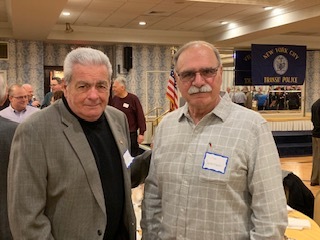 Treasurer Tony Lomanto spoke of the scheduled meetings for 2019 that will appear in the next issue of "Beyond the Line." 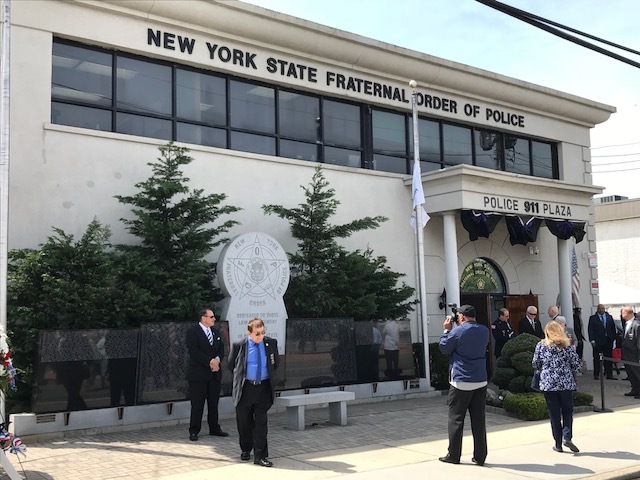 Please note that the May meeting which is usually held at Antuns because the NYS FOP has to ready the hall for the Anual Police Memorial, had to be changed. 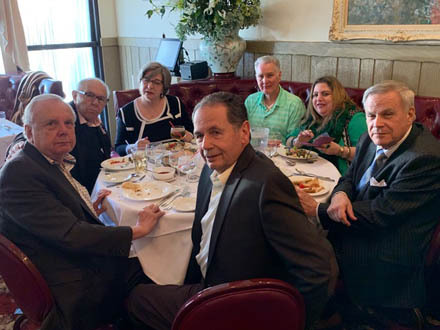 Antuns would not have a date available until mid May and considering it was too close to the June meeting, it was decided by the board that the May 2019 meeting will be held at Verdi's Caterers in Westbury, Long Island. As a change, that meeting will be a luncheon to start at 1:30 PM. 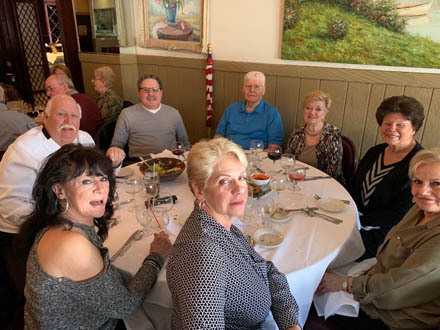 By a show of hands at the meeting, many members do favor an afternoon luncheon rather than the normal evening meetings. As we get older (at least some of us :-) ) night vision is decreasing, making night driving more difficult and keeping many members home, rather than attending the meetings. 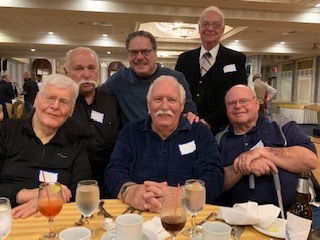 Financially we are doing well but membership has dropped due to deaths and no new members joining, especialy those from the very last Transit PD class in the '90s. We don't want to see our "Transit Family" diminish due to lack of concern. 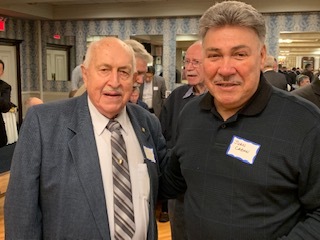 1st VP Bob Valentino spoke of having members who come to the meetings to try and get others to also attend, either by driving them or contacting them. 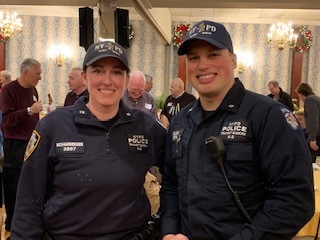 He also mentioned that we will be bringing membership applications to the NY Reunion on the 13th to try and get more fellow officers to join. 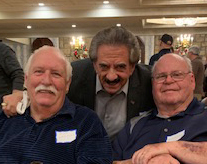 When a benefits question raised by member Steve O'Rourke was brought up about hospital stay charges with HIP and Medicare, Bob and Deo Fasolino stated that HIP is primary if covered by that plan and Medicare is primary with others. Legislative Director Tony Piazza spoke of the election results from the previous day. The NYS Senate and House are now controlled by the Democrats and our strategy for getting the VSF has to be changed to now appealing to the ruling party for any passage of the bills. One of our staunch supporters, Sen. Marty Golden of Brooklyn and Chairman of the Civil Service and Pensions Committee, is still in a deadlock with his opponent. Final mail in ballots have not been completed and he is still holding out. We wish him well in the election. Barbara Hassler, widow of the late 2nd VP Harry Hassler, read a story that Harry had written a few years ago. It has to do with the many passes of "The Heaven Bound Railroad" he had given out over the past several years. The article will appear in this next issue of our newsletter coming out soon. 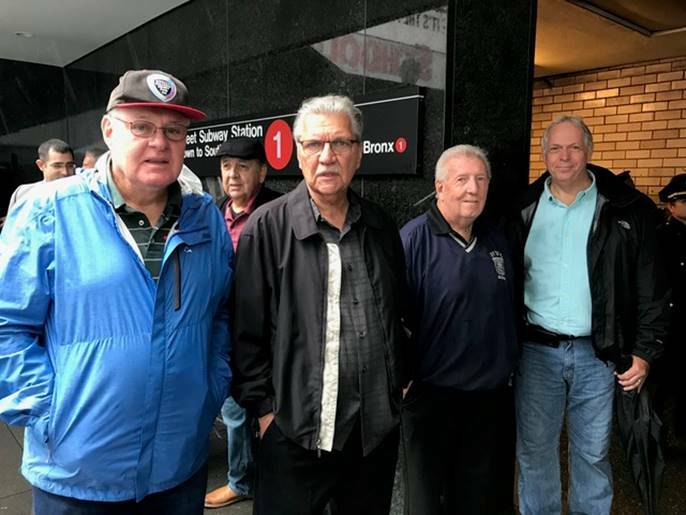 Henry Melchiona thanked the Retirees Association and those who recently attended the memorial service for his brother Mike when a plaque was placed at the 50th Street station where Mike was killed in the line of duty. 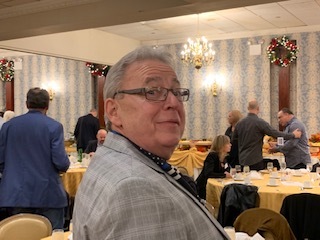 Vinnie Servedio spoke of the next "ROMEO & JULIET" Valentine luncheon scheduled for a day in February, 2019. Details will be posted when they become final. Tom Greer mentioned he is working on the Mets baseball game tickets for 2019 and this will be posted when finalized. 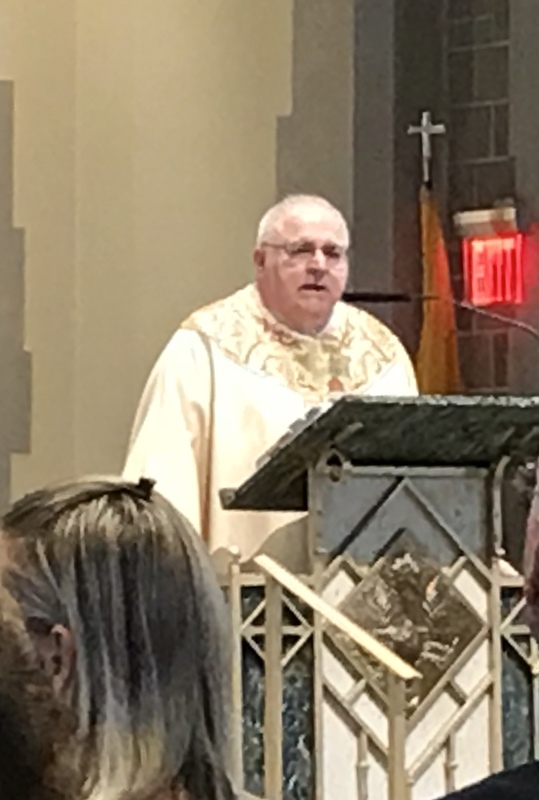 President Lanning spoke of the upcoming Christmas & Holiday Party on December 5th at Antuns. We welcome our members, families and friends. The cost remains the same this year - $25 for members and $35 for non-members. 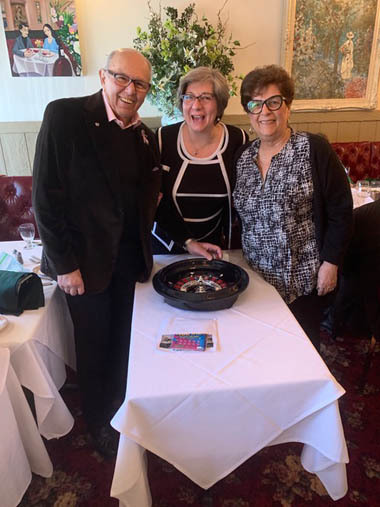 The 50/50 raffle was held and we again thank John Reeves, for the many gifts has has given us. The Association wishes to take this opportunity to thank our member, Ret. P.O. 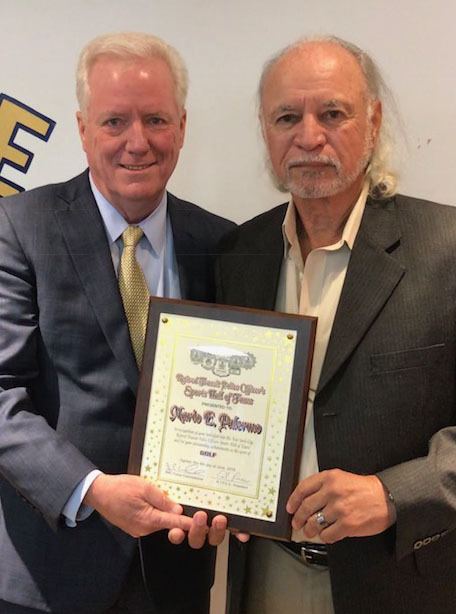 Tom Golden, as the funeral director at Gleason Funeral Home in Bayside NY, for the outstanding services rendered for the Edward Russo funeral. Tom was extremely helpful in obtaining the special flower arrangement for the Association. We also wish to thank all those who attended the wake and funeral services. 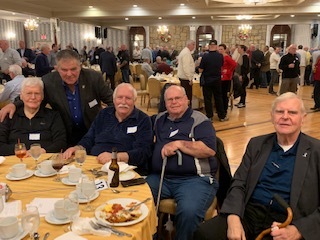 The Executive Board will now consist of the following officers: Mike Lanning as President; Bob Valentino as 1st VP; Ron DiMaio as 2nd VP; John Giangrasso as Executive Sec'ty; Bob Forrester as Recording Sec'ty' Greg Stripp as Financial Sec'ty; Tony Lomanto as Treasurer; and Frank Crisa as Editor. Our thanks to Executive Secty Ron DiMaio for taking the minutes of this meeting. � 7:40 PM Meeting called to order by 2nd Vice Pres. Bobby Valentino who led the Pledge of Allegiance. !st VP Mike Lanning and Treasurer Tony Lomanto were excused. Bob mentioned those members who passed away since our last meeting: Det. Sgt. 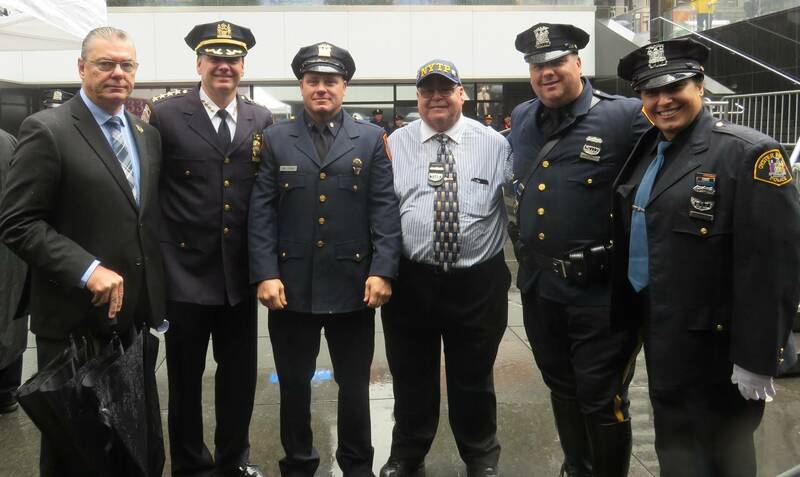 Lou Cosentino, Chief John Pritchard, and others. 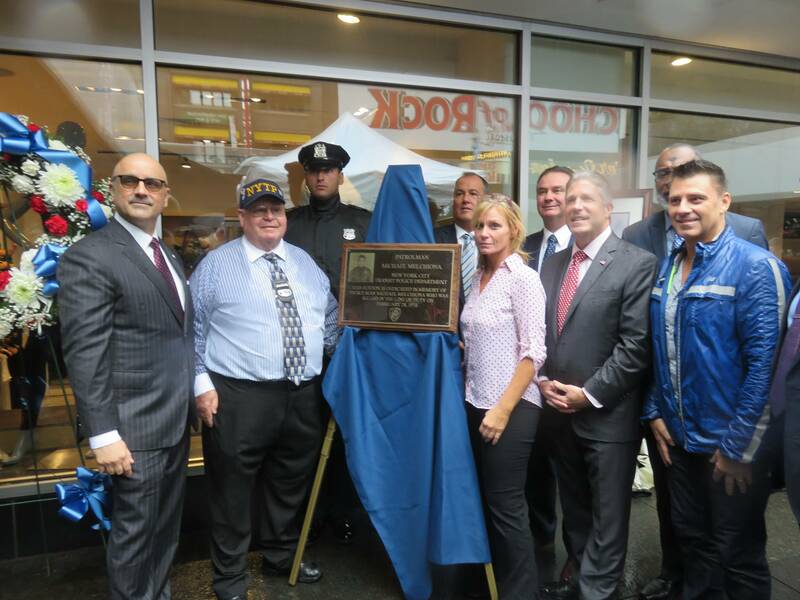 There was a good turnout for the street naming for TPO Michael Melchiona. His brother Henry addressed the members present. � Charlie Moran spoke about Richie DeGuglielmo being granted parole. He thanked our Association and other organizations for our support. Date of release is January 7, 2019. � Ron DiMaio spoke about HR6105 that would amend the LEOSA (HR218) that would afford needed improvement as: 1. Being able to use high capacity magazines. 2. Being allowed to carry hand guns in schools. 3. Being allowed to carry on AMTRACK Trains. 4. Being allowed to carry in National Parks. 5. Standardized course of fire etc. He urged members to contact their Congressman to vote in favor of this bill. 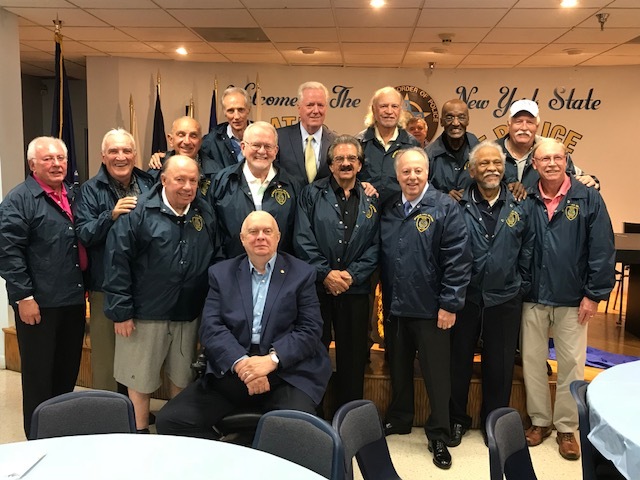 � Bobby Valentino spoke about the Bowling League dinner dance and the fellowship that exists there. � Tony Piazza spoke about the VSF and the lack of support from line organizations. Our bill failed this year with the excuse that we need a home rule message. This is not true as it was a collective bargaining agreement. A new bill will be brought out next year. � Bobby Valentino mentioned that Tuesday, November 14th is the TP Reunion at Antuns, 4:00 to 8:00 PM, $60.00 per ticket. 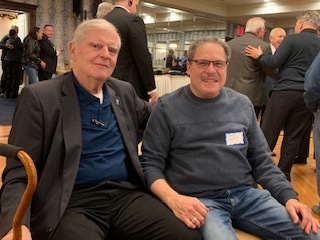 � Tom Greer spoke about the Mets and Yankee Game on July 2, 2019. He had some pins, shirts and jackets for sale. � 50/50 drawing was held. John Reeves donated many gifts that were raffled off. � 8:40 PM the meeting was adjourned. From the Retired Sergeants Association regarding the current problems with (all) Transit retirees needing their ID card renewed. It also applies to retirees trying to contact the Unit by phone and attempting to set up an appointment. This message is for those RSA members who have a retired NYC Transit or Housing ID card with expiration dates that are due to expire soon. The NYPD Transit Bureau Personnel Section maintains the Transit and Housing pre-merger retiree ID card database and they are responsible to print the cards upon expiration. At this time, the Transit Personnel Section is having issues with the ID card software and printer. They have not advised a time frame in regards to a resolution of this issue. We are requesting that at this time that members DO NOT send any expiring Transit or Housing ID cards to the RSA ID Card Desk until further notice. We apologize for this inconvenience and are working on a quick resolution to this issue. The deadline for submissions for the World Trade Center Notice of Participation has been extended until September 11, 2022. It was reported recently that the submission deadline was September 11, 2018, but that has changed. Although the new deadline is four years away, we urge all active, retired and vested members to submit their Notice of Participation as soon as possible. All relevant forms can be found on the NYPD Police Pension Fund website. Please don�t delay in taking immediate action on this most serious matter. The Memorial Ceremony for Ptl. 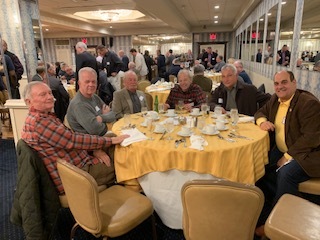 Mike Melchiona was a well attended event with Ret. P.O. 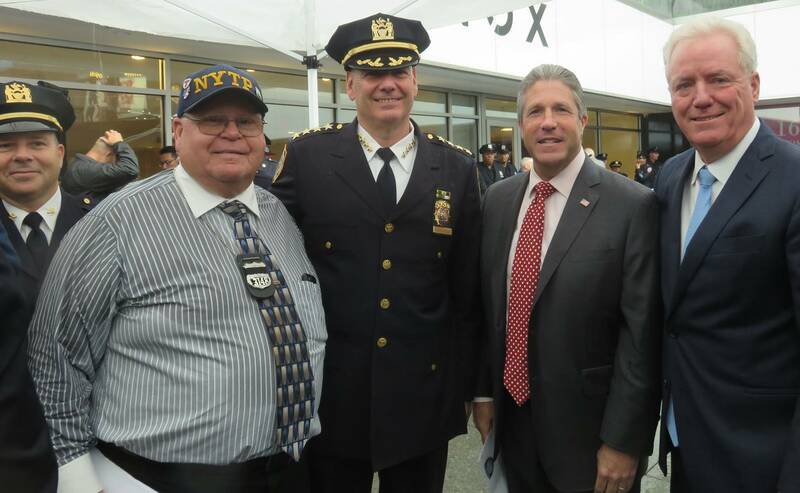 Henry Melchiona and his family, NYPD Chief of the Department Terence Monahan, Admin. 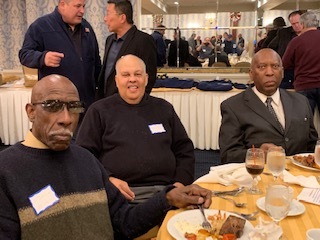 Chief Bob Ganley, TA President Andy Byford, District 1 CO Capt. 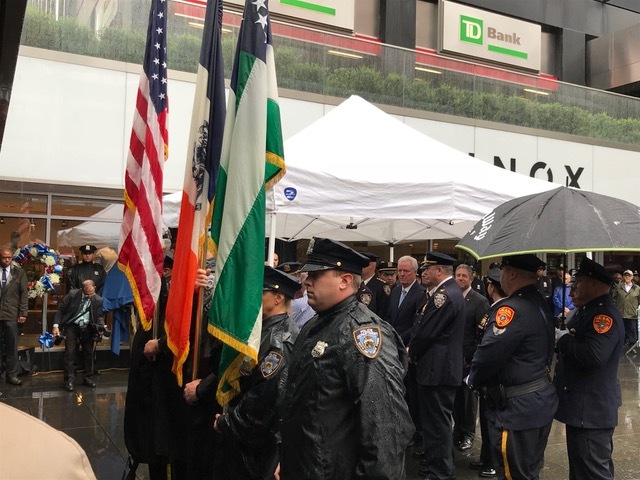 O'Sullivan, former Transit Bureau Chief Joe Fox, PBA President Pat Lynch, a contingent of Officers from Suffolk County PD, and other NYPD uniformed ranks and the NYPD COlor Guard and Band contingents. 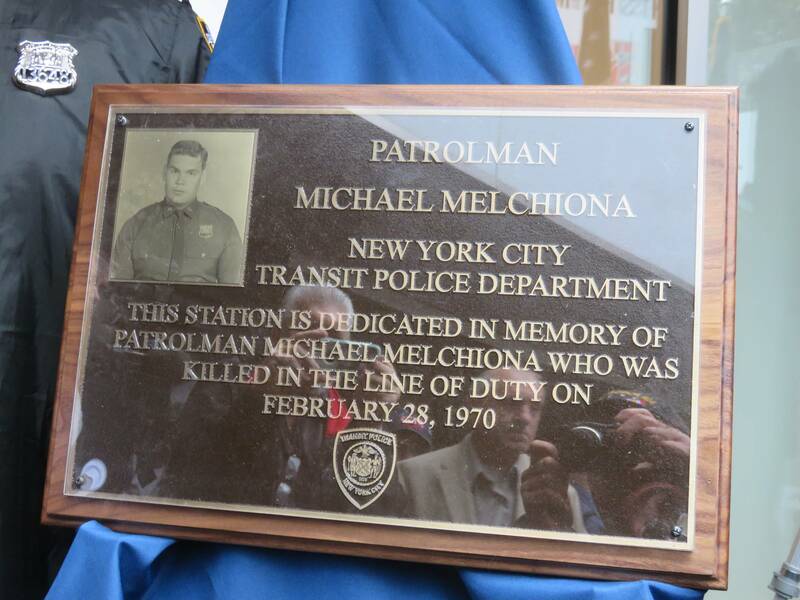 Today was the long overdue recognition for Mike Melchiona who was killed in the line of duty on the 50th St & Broadway IRT subway station on February 28, 1970. A brass plaque will be mounted on that station in Mike's memory. 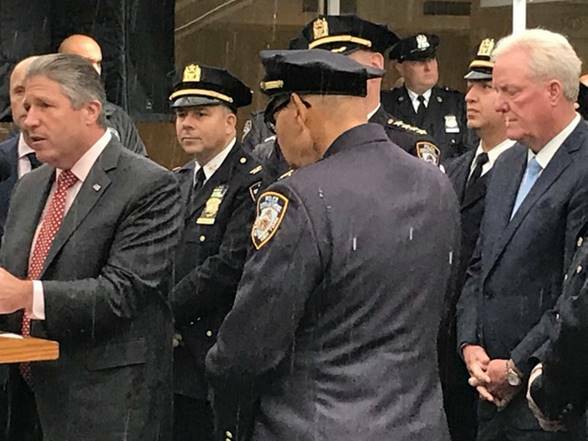 I was speaking with Mike�s brother, Henry, this evening who told me that he and his family were overwhelmed by this tribute and the number of retirees, active police officers, Chiefs, former Transit Bureau Chief Joe Fox, and other ranking officers, PBA Pat Lynch, Deputy Commissioner Bob Ganley, and the MTA President were in attendance. Also, in attendance were Pipes & Drums. K-9 Units and police officers from various police departments from the NY & NJ area. 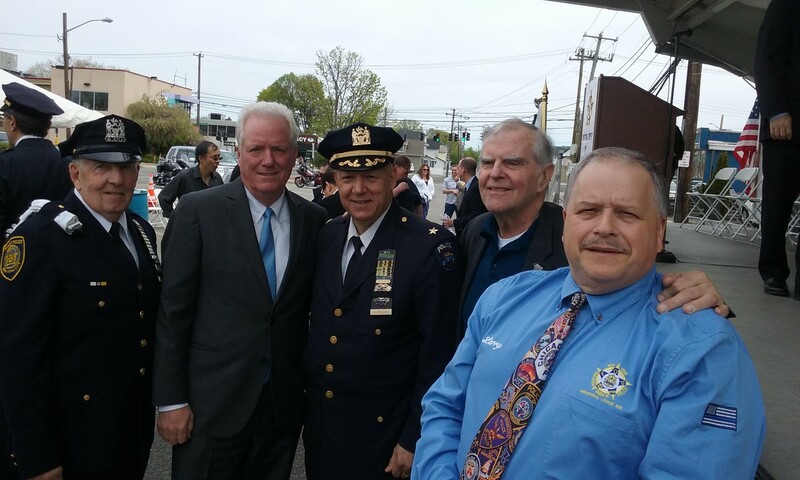 There were many Suffolk County Police officers including Henry�s son and nephew who are both detectives with the SCPD. After the dedication the PBA provided a luncheon in District 1 for all the attendees and guests. This was a very proud moment for the entire Melchiona family. With President Ed Russo in the hospital for medical issues, 1st Vice President Mike Lanning called the meeting to order at 7:20pm with the Pledge of Allegiance. 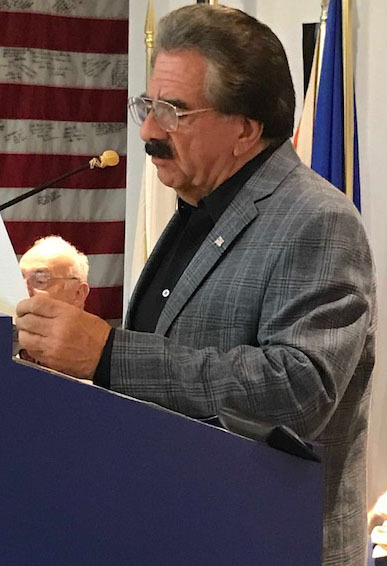 Treasurer Tony Lomanto gave the membership an update regarding the illness of our President Ed Russo. Tony mentioned that Ed has multiple issues including a knee replacement and asked everyone to pray for Ed�s full recovery. Tony also named the members who recently passed away. The meeting was suspended for the refreshments being served. 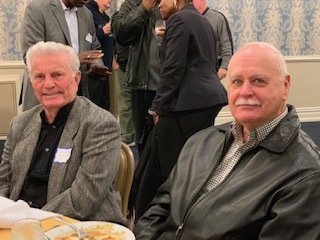 Mike Lanning announced that President Ed Russo has appointed Recording Secretary Bob Valentino to 2nd Vice President of the association and asked if any members present would like to assume the office of Recording Secretary. There were no volunteers for that position. Bob will handle both positions for the time being. 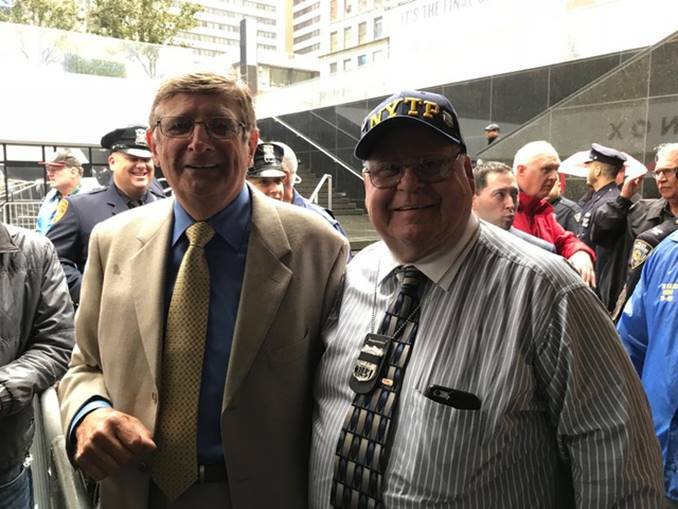 Member Hank Melchiona spoke about his brother, Transit Police Officer Michael Melchiona, who was killed in the line of duty on February 28, 1970 and stated that the subway station at 50th Street and Broadway will be named in Michael�s honor. 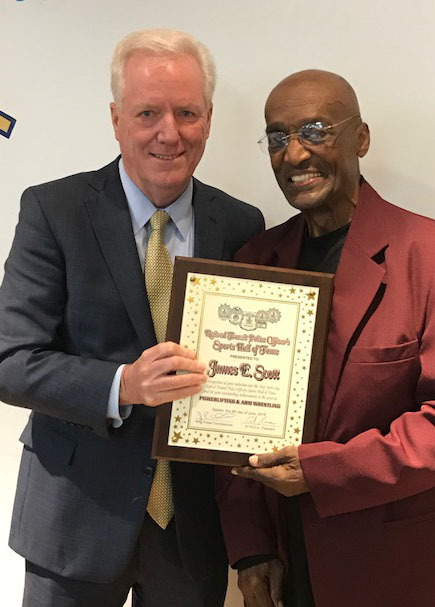 Hank asked for members to attend the dedication on Monday September 10, 2018 at 11:00 a.m. Hank also mentioned the late great Pat Townsend and how Pat was always there for the family especially at Christmas time. Mike Lanning mentioned that the School Red Light Cameras are back on throughout the city so if anybody is going to the dedication to be aware of the cameras. 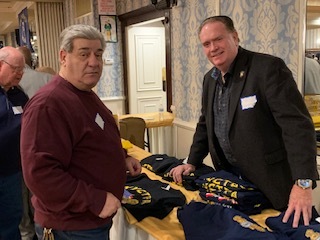 VSF Committee Chairman Tony Piazza, spoke about the VSF Bill indicating that it was dropped in Albany because of a home rule message but stated that member Floyd Holloway will assist him in submitting a new bill. Our Association Surgeon, Gerald Ente (88 years young), advised the membership not to believe medical advice on social media. He mentioned that coffee (caffeine) in moderation is good for your heart. He also stated that lentil soup and lentils in general helps to prevent diabetes. He talked about the Measles epidemic in Europe and highly recommended that all children get vaccinated. . 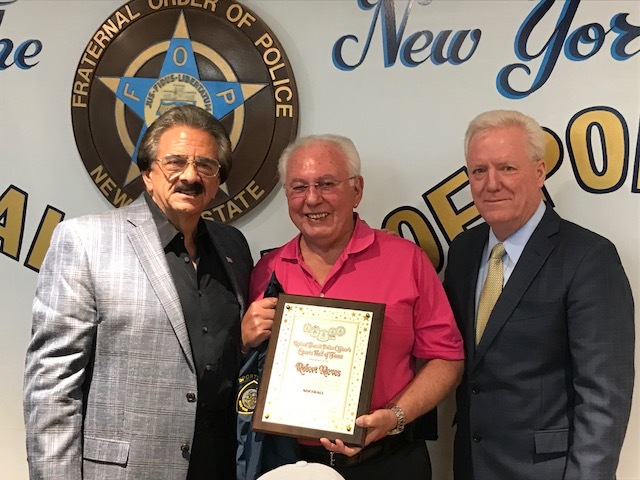 Member Joe McGarry, speaking on behalf of the FOP, notified the membership of the Pig Roast and Cigar Day on Saturday September 8th at the Hicksville NYS FOP lodge. The 50/50 raffle was conducted by Vice President Mike Lanning & Treasurer Tony Lomanto. There were five $20.00 cash prizes with 12 additional prizes supplied by a very generous John Reeves. At the next meeting in October, if anyone is interested in the office of Recording Secretary, please announce your intention then. 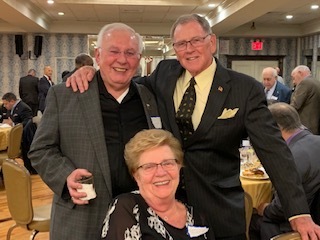 Thank you for that lovely message about my Dad...Lifetime member Ret. P.O. Robert Pfeiffer, who passed away on August 8th. I wonder if you might be able to help my family out. 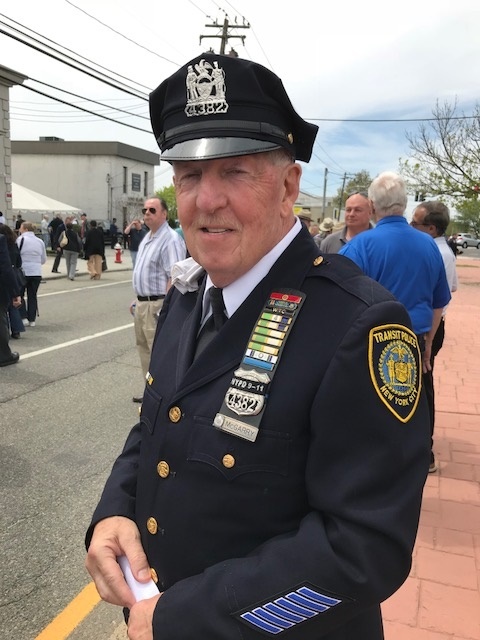 There was a retired Transit Officer at my Dad's funeral this past Monday (Aug. 13th) at Our Lady of Lourdes Church in West Islip. He spoke with my Mom and one of my sisters. He was very nice and talked very fondly about my Dad. 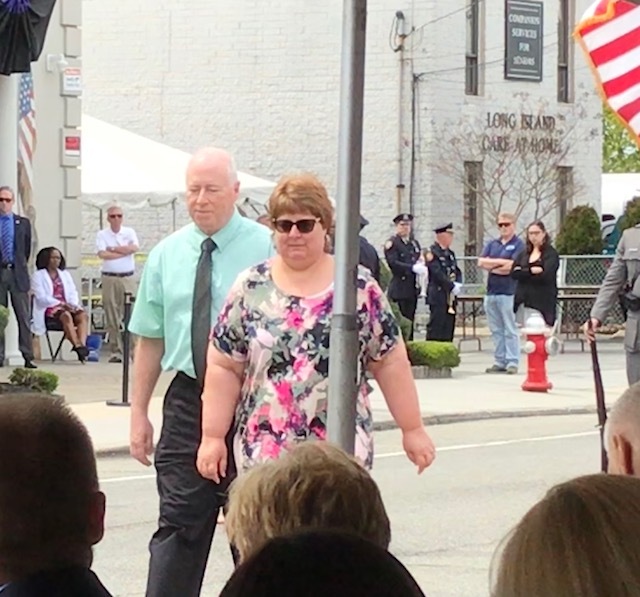 When the procession was leaving the church and going to LI National Cemetery at Pinelawn, this gentleman stood at the street with his hand on his heart...honoring my Dad. My Mom and all of us 'kids' would very much like to contact this gentleman, but we did not hear his name. 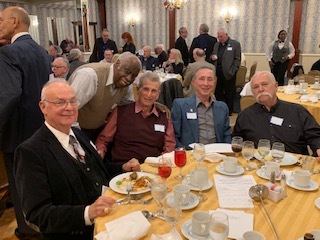 Is there any way that you might be able to post a note on Beyond the Line asking him to contact me at 631-804-8334 or by email at debspf@gmail.com. If you are the retiree who attended the funeral and spoke to Marlene Pfeiffer, please contact their daughter Deborah at the above number. 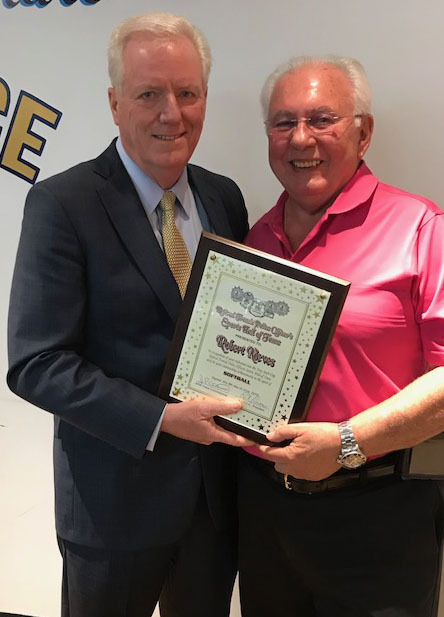 President Ed Russo has appointed former Recording Secretary Bob Valentino to the position of 2nd Vice President, filling in the office formerly held by the late Harry Hassler. 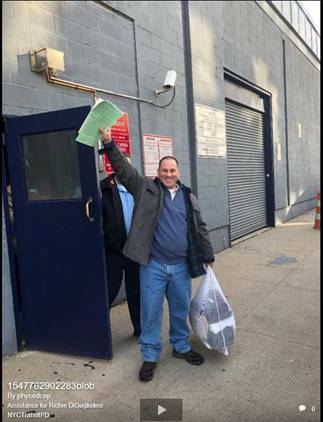 Robert Hayes was granted release on June 12th. He was convicted in 1974 of shooting and killing NYPD Transit Officer Sidney Thompson in 1973. 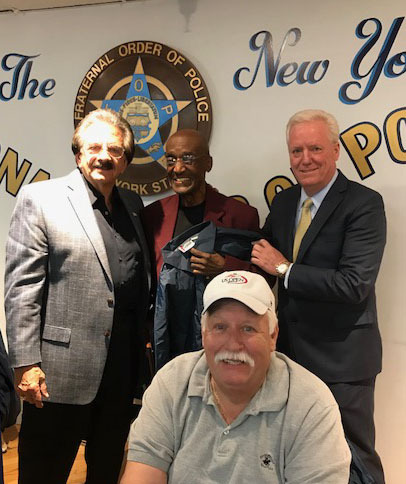 Hayes� impending discharge, which could come as soon as Sunday, follows the release in April of another convicted cop killer, Herman Bell, who was convicted in the 1971 shooting deaths of NYPD officers Waverly Jones and Joseph Piagentini. The board�s vote was quickly criticized by law enforcement unions. 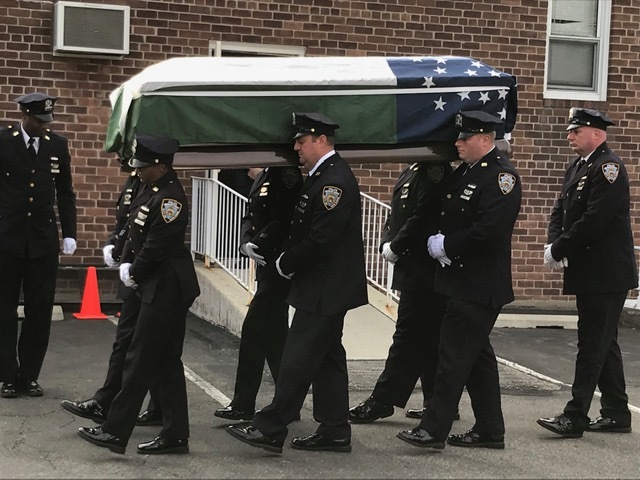 �It is a travesty that yet another murderer who killed a member of law enforcement in cold blood will be turned loose on the streets to reintegrate with the public, whom his victim gave his life to protect,� said Michael Powers, president of the New York State Correctional Officers and Police Benevolent Associated. Powers also slammed an executive order Gov. Cuomo issued in April that gave parolees the right to vote. �Forcing citizens to be vigilant that convicted killers may be in their polling place makes a mockery our democratic process,� he said. June 20, 2018 THE VSF BILLS IN ALBANY ARE DEAD IN THE WATER! Despite the untiring efforts of the association's legislative committee led by Chairman Tony Piazza, and his able assistants, John Rini and John Giangrasso, the bills submiited in April died in committee when the City of New York somehow, at the last minute, was able to insert a clause requiring a Home Rule Message. Knowing the past actions of our former employer, it turned out to be a death sentence for the bills. I regretfully report to you that I have just been informed by our legislative committee that our sincere and hard work with our efforts to obtain the latest VSF has �BEEN LOST�. I was further informed that at the last minute in committee in Albany, and without anyone really noticing it, the home rule was inserted back in the bill making it impossible for the bill to pass. This is what shot us down the last time. I believe this shows the integrity of some of our politicians: you just can�t trust any of them!! Please give credit to our legislative committee who worked so hard and diligently with so much time and effort they placed into this. Please inform or forward this to all members concerned. The cost-of-living adjustment (COLA) for September 2018 through August 2019 benefit payments is 1.2%. This latest COLA will bring the cumulative maximum monthly increase since COLA legislation was enacted in 2001 to $348 (see chart below). New York's permanent, automatic COLA is designed to help offset inflation's adverse effects on the fixed retirement benefits of the state's public retirees. By law, the COLA can be no less than 1% and no more than 3% annually and is applied only to the first $18,000 of the retirement benefit. The COLA percentage is calculated by taking 50% of the Consumer Price Index (CPI) increase from one March to the next and rounding up to the nearest tenth. The CPI increased 2.36% from March 2017 to March 2018. 7:15 PM President Russo opened meeting and led the Pledge of Allegiance. Treasurer Tony Lomanto read the names of those members who have died recently. A motion was passed to suspend the regular meeting for the induction of members into the Sports Hall of Fame. Jim Scott and Mario Palermo-Lugo spoke to the members present and thanked the Association for their awards. Tommy Greer is handling the tickets for the Mets-Yankee Game and is sold out. Our thanks go out to Tom for his hard work. Our good friend Paul DiGiacomo, V.P. of the D.E.A. is recovering from a recent illness. Dr. Ente, M.D., our Police Surgeon, spoke about a new inoculation shot for Shingles, which is 90%+ effective. The old shots were only 20% effective. The new one will soon be covered by insurance. The cost is about $250.00 for two shots which are spaced six months apart. Cancer is being caused by plastic that was burned at the World Trade Center site on 9/11. Probiotics in yogurt, sour cream, Activia, etc. to put good bacteria into your body to build up immunity. He recommends that everyone should take probiotics on a regular basis. 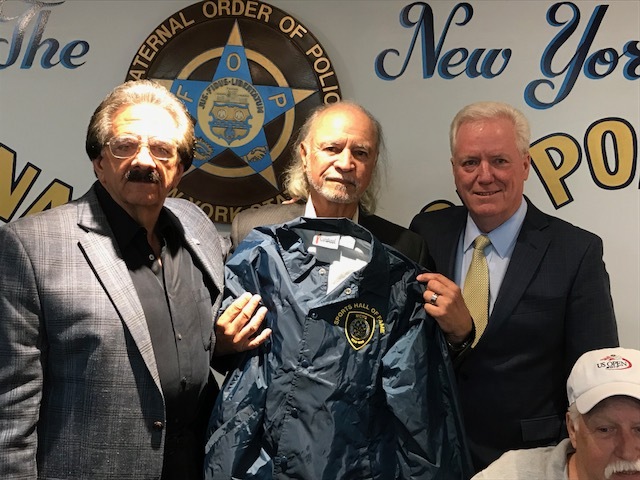 Ed Russo reported that the FOP will run a nine day cruise in July 2019. The next two meetings are: September 6, at the FOP and October 4, at Antun�s. Legislative Chairman Tony Piazza spoke about the two VSF Bills that we have in Albany. Please see Beyond the Line for information to write letters urging passage of these Bills. There are now less than the 457 retired Transit Police Officers reported in the 2017 actuarial report that would be entitled to the VSF. 50/50 drawing was held. We had four $50.00 cash prices and merchandise that was donated by Ret. Sgt. John Reeves. 9:05 PM the meeting was adjourned. 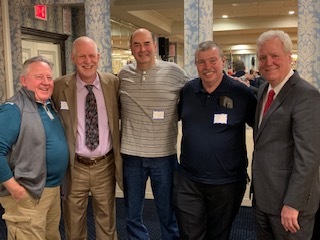 Our congratulations to the newest members of an elite group of athletes and a hearty thank you to Bobby Valentino and Bob Ganley for putting this memorable event together. Transit Police Officer William "Billy" Martin. 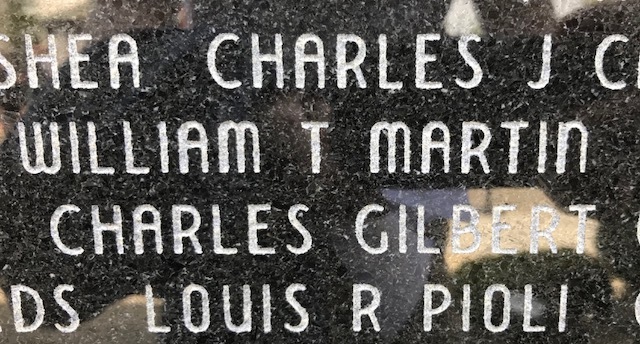 Billy's name was added as a result of the untiring efforts of our 2nd VP, Harry Hassler and with help from member Bob Ganley, who fought hard to get Bill classified as a Line Of Duty death. 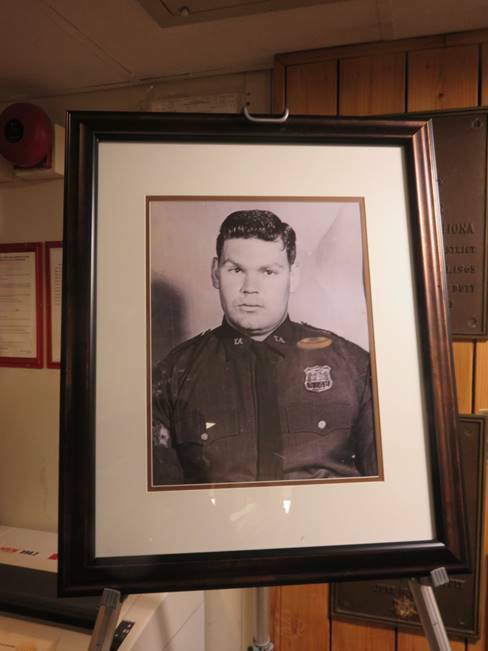 It also resulted in Bill being placed on the Memorial Wall of the NYPD at 1 Police Plaza last year. Below are a few photos taken at the ceremony.